You’re existing website could be hindering your business, whether recently designed or if it’s been live for many years. There could be a range of reasons which could include the following list. This will hopefully answer the question “Do I need a redesign”. Not search engine friendly with google, yahoo, bing etc. We know not all the above may apply, but if you have just one issue it could be causing people to not convert visitors to customers. Narrowing this down will help you know what improvements can be made. From the above list, best thing to do is to highlight which issues could apply to you, the most common ones are relating to the content on your website, keywords and user experience that your site gives. All the above factors can be measured by firstly ensuring that you’re tracking visitors to your website. Google analytics is a great industry standard tool for this. You cannot truly know what your issues are without first benchmarking, then analysing the results and making changes. What visitors you’ve had monthly over the past year? How long did they stay and what page were they visiting? Were they on a desktop, tablet or mobile? Do visitors bounce off the website with a high percentage or low? Do you notice your visitors don’t stay long on given pages of the site or across all pages? Does your traffic primarily come from organic traffic or other sources? This data may confuse you, but without measuring the data you won’t know where to go next. You should compare month on month what is changing on your site to see any bad trends or changes. If the statistics are bad and constant over the few months, such as low visitors on mobile, desktop and tablet devices, high bounce rate, average time on Page is very low, then it’s a sign your landing pages are not performing and need an overhaul. After analysing these issues, benchmarking and analysing the analytics data, you will know if its time for a website redesign of your website as dependant on the amount of issues, having a fresh search engine friendly design with striking images and optimised content will put you on the right track. Get your content all rewritten by a trained copywriter and up to date as soon as possible. Ensure you update the existing pages and/or create new pages that relate to the latest content. Get a web developer to apply redirects from the old pages of your website to the new to ensure that Google doesn’t have dead pages its still indexing in the search results. Ensure your pages are plugged with relevant keywords for search engines. Add some goals to the website to track when a user completes an enquiry or when the click to view a video etc as this will give you valuable data in google analytics. Get SEO work done to start building external value to your website. With all these factors you will certainly start seeing improvements in the traffic to your site and through continual monitoring of your google analytics data this will hopefully show an improvement in the time people spend on the site and improve conversions. 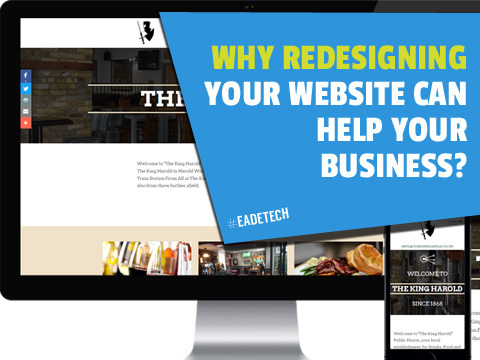 If you’re unsure how to go about re-designing your website, speak to Eadetech Web Design for support on this.